ABI Electronics are continually investing in the latest equipment and technologies to further enhance their capabilities and capacity, whilst striving to achieve quality excellence. Dek Horizon 03iX screen printer: in-line system with full camera vision alignment to facilitate high accuracy and repeatable printing. Under-stencil cleaning system. 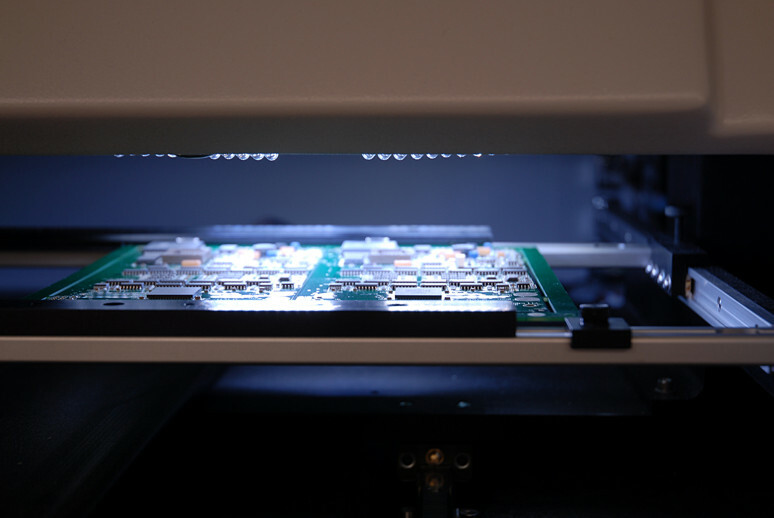 HawkEye® - high speed deposit verification system that checks each PCB for correct paste coverage after printing. NEW! Samsung SM482 Advanced Flexible Mounter: approximately 28,000 CPH. Capable of placing 01005, 42mm IC's, Connectors (Lead Pitch 0.3mm), uBGA, CSP(Ball Pitch 0.4mm). The SM482 has a newly upgraded placement accuracy correction system ±50µm@µ+3σ/Chip, ±30µm@µ +3σ/QFP. Samsung CP45FV NEO SMT placement system: approximately 15,000 placements per hour. Capable of placing 0201's to 0.5mm µBGAs and 0.3mm QFPs with +/-0.04mm 3 sigma accuracy. Fritsch manual Pick & Place machine: ideal for some quick turnaround prototypes, manual placement alternative for unusual sized components or small batch qty’s not suitable for automatic machines. BTU Paragon 70 reflow oven: 10 individually heated temperature zones to enable optimum process window. Dual conveyor with centre PCB support. Full inert gas reflow capability. YESTech B3 Advanced, high speed, multi colour benchtop Automated Optical Inspection (AOI): offers off-line benchtop PCB assembly inspection with exceptional defect coverage. This benchtop system inspects solder joints and verifies correct part assembly enabling users to improve quality.